Opening reception for exhibition "Imagined, Desired, and the Factual." Purdue University Galleries. 5:30 pm in Fountain Gallery, 330 Main Street, Lafayette. 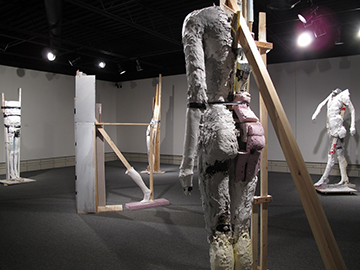 Artist Emily Trick will discuss her work in the gallery. Emily Trick’s sculpture is mostly figurative but the process in which they are created is loose and less controlled, allowing direct gestural manipulations that break the figure into fragmented surfaces held together more by an idea of the figure rather than by its direct representation. The everyday qualities of the materials turn the figure into something found or invented. Her hope is that each individual piece can be transformed into a “site,” or a point of social tension, that is as much private as it is collective and shared- an individual expression of common concerns and experiences. When grouped together, the emphasis is as much on the pieces’ individual presence or absence as well as on their interaction. This interaction dissolves the figurative specificity of each of the pieces into an abstracted space reminiscent of a forest, or, conversely, a raw field of undigested materials engulfing the visitor in the sources of its formation; a space filled with tension between imagined, desired, and the factual. Trick was awarded an Ohio Arts Council Individual Excellence Award for 2013 and completed this work in part through The Jentel Residency Program and the National Artist Teacher Fellowship Program.